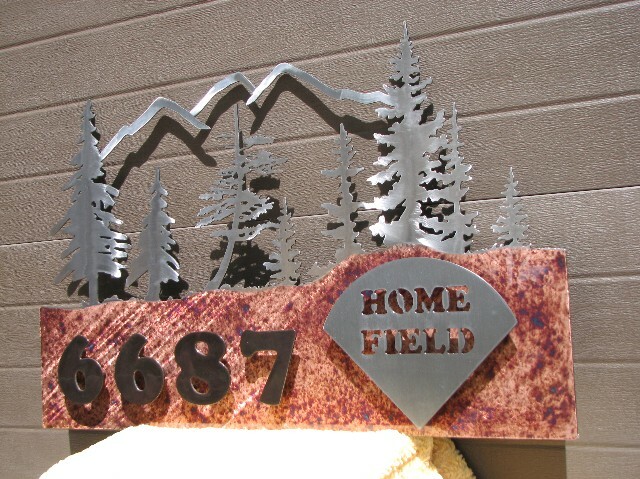 *The base price includes the sign with the information cut into the steel. 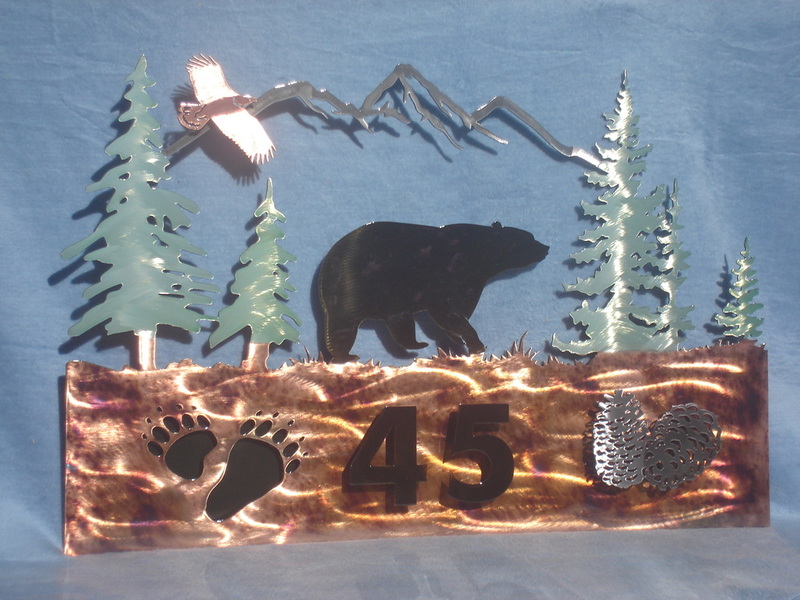 Please call for additional pricing for custom raised/three dimensional items. 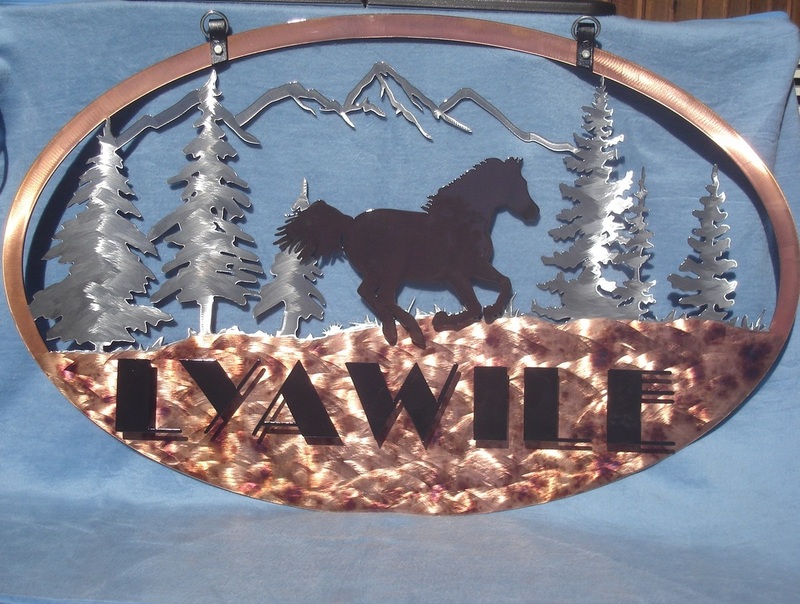 Custom Metal Art Gate Sign. 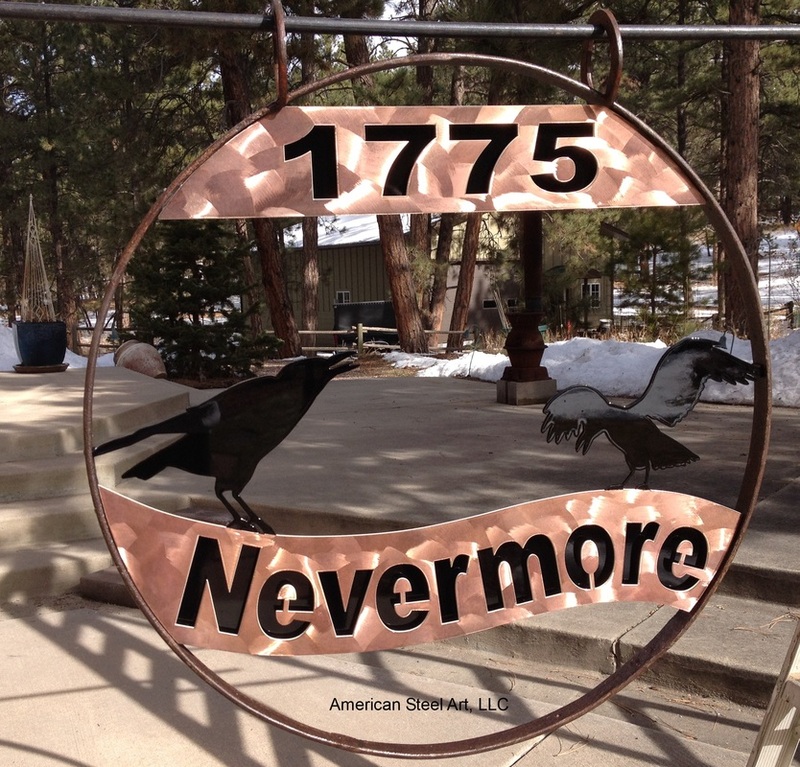 Nevermore. The wagon wheel is from a wagon that traveled from Texas to Colorado. Call for pricing on this sign. 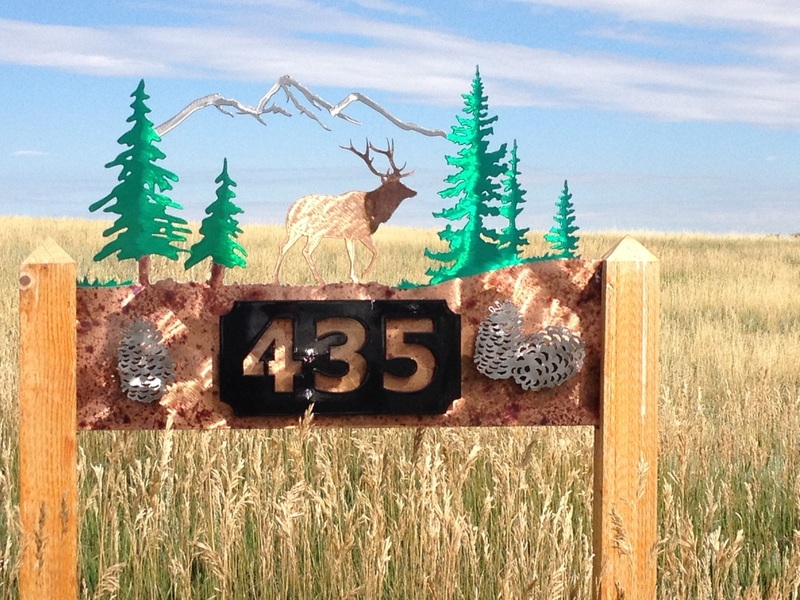 Elk Address Sign with Raised Plate. 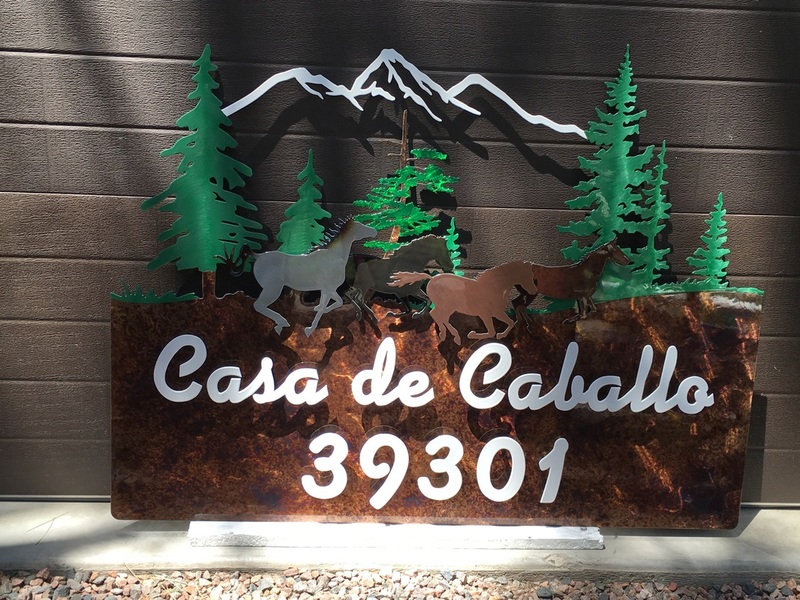 This gate sign is the "ranch" name for this property. Named after their grandchildren. This sign is a repeat customer that recently moved. 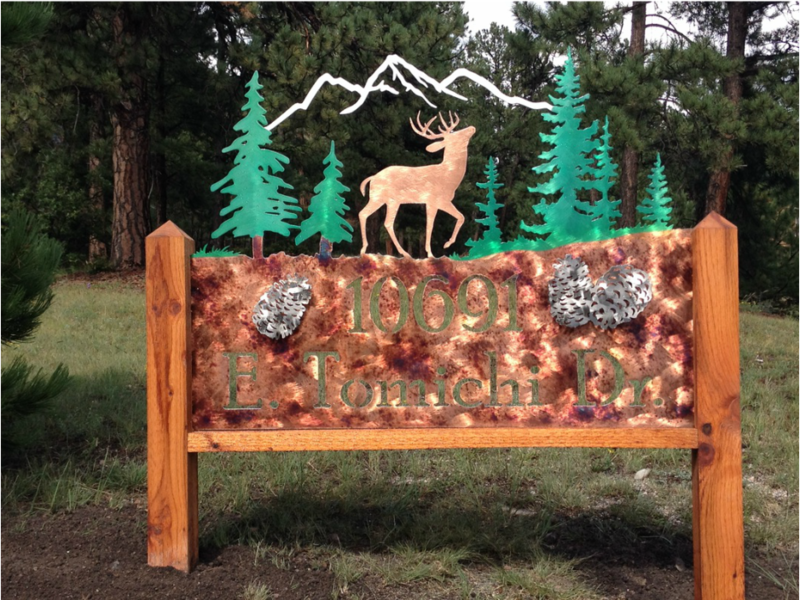 Large size Elk address sign. Medium Size Sign going to the plains. 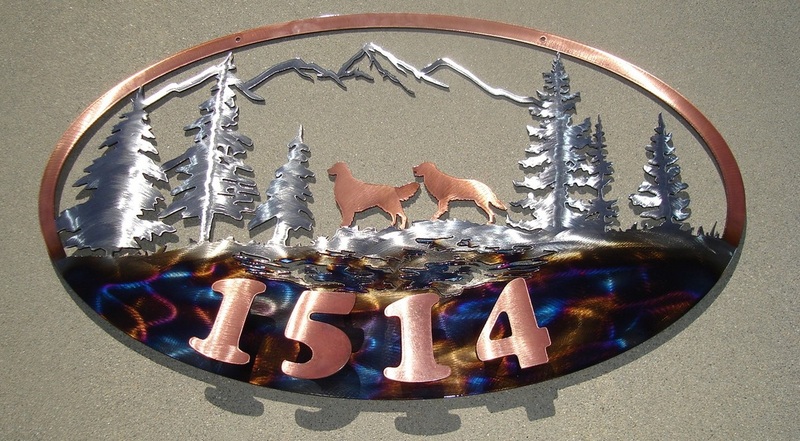 Custom sign using a wagon wheel for the mounting. This custom sign is stainless Steel and all of the letters are raised off of the Sign. The "U" and the "C" are three dimensional horseshoes. Cattle with Christmas tree. 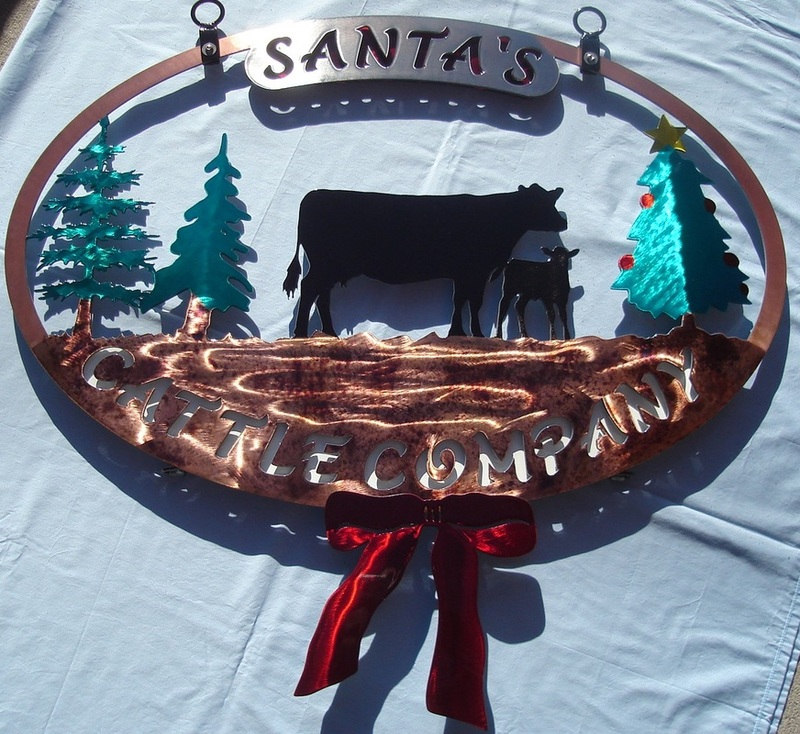 There is a backing plate that is red behind the word "Santa's" as well as a backing plate that is white behind Cattle Company. The red bow is a "pop-out" added to the bottom of the sign. 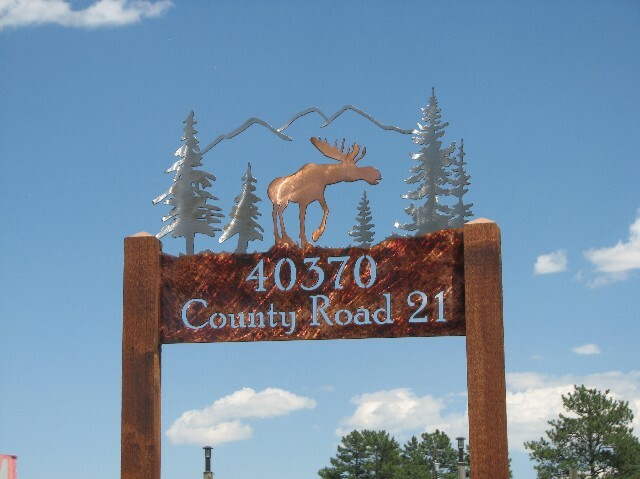 There is an eagle on the top of this sign, and paw prints are cut into the steel. 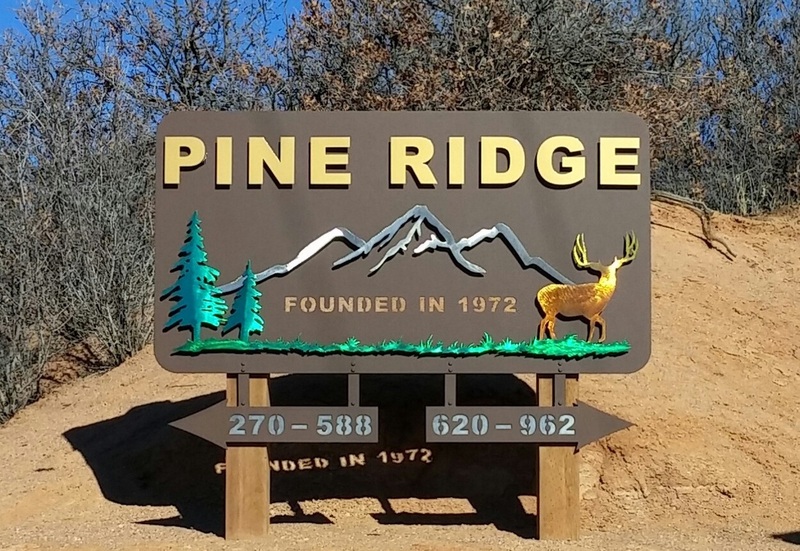 There is a backing plate on this sign, and the numbers and pinecones are raised off of the sign. The trees are sage green. 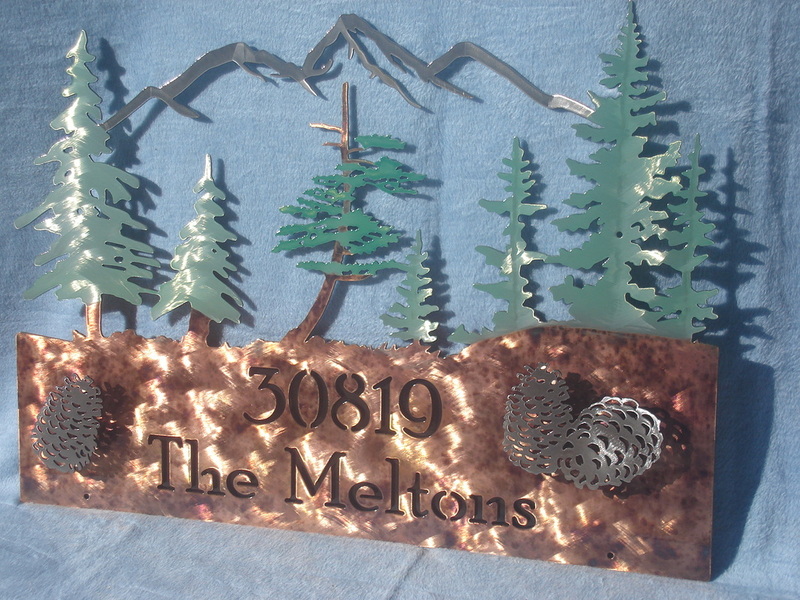 Custom sign with raised name. 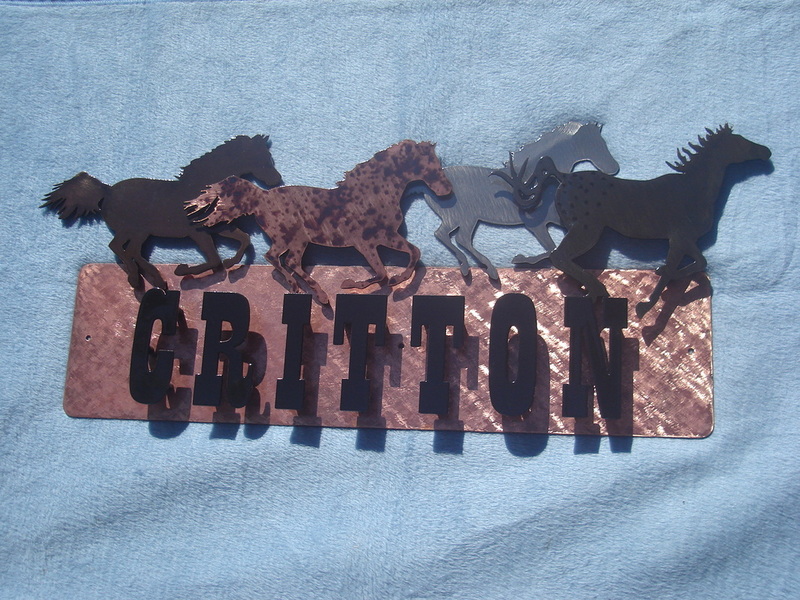 The name Critton is raised off of the steel on this sign. The horses are mounted at different heights for a 3-D effect. 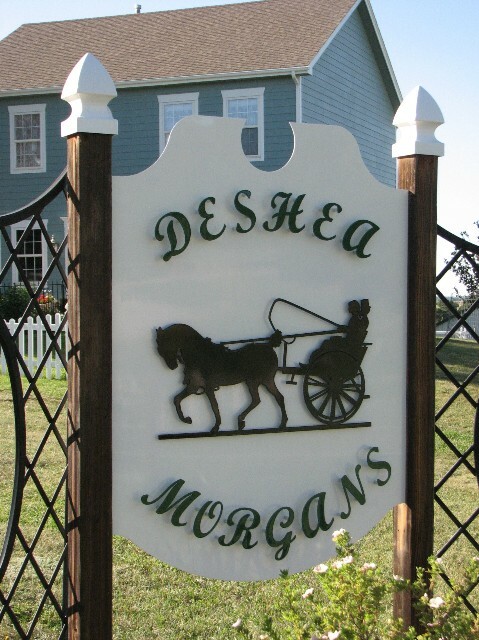 This sign made out of steel is painted white with the Deshea Morgans and carriage raised off of the steel. This sign has been heated with a torch to create the "water". The fish is set off of the steel. 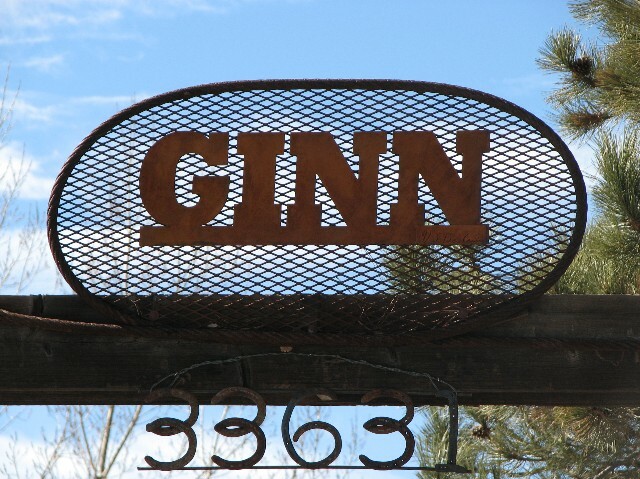 This sign is made from expanded mesh with the name cut out of steel and allowed to rust. The numbers are made out of horseshoes. 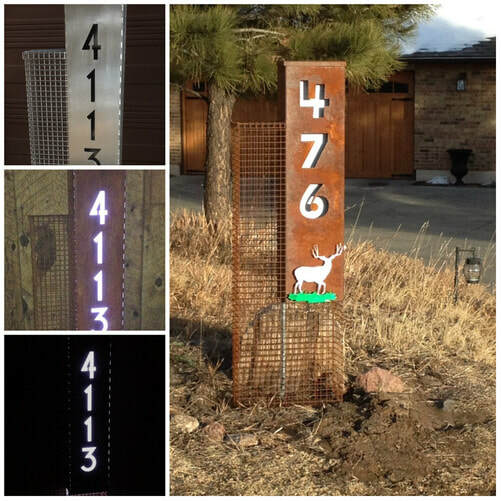 The base of this sign is heated with a torch and the numbers are raised off of the sign. 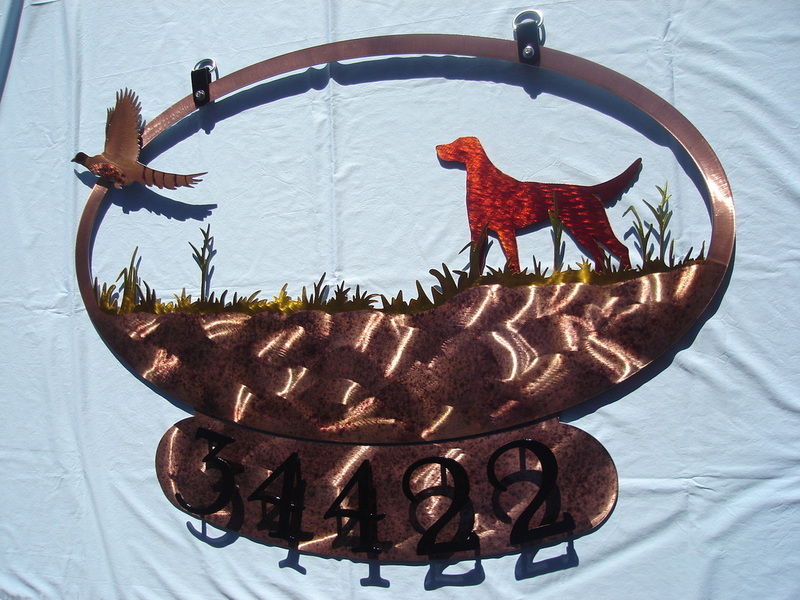 This sign has golden colored grass with a red dog and a pheasant. The house number is raised off of the bottom plate for removal should the owner move. 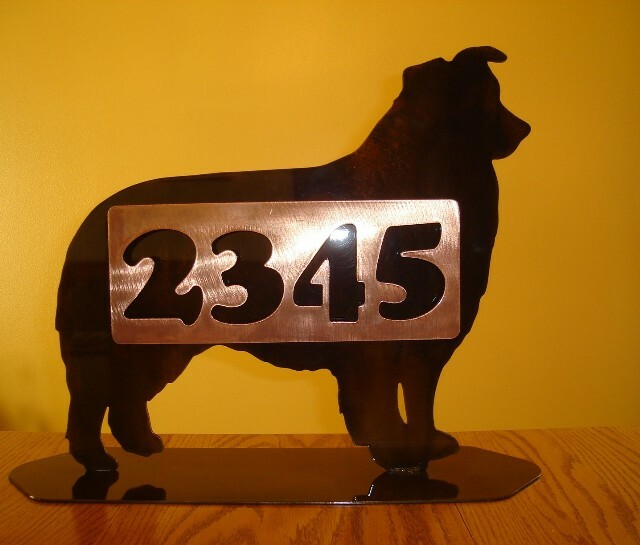 Silhouette of animal with a plate raised off and address cut into the plate. The numbers and Home Field plate are raised off of this sign. 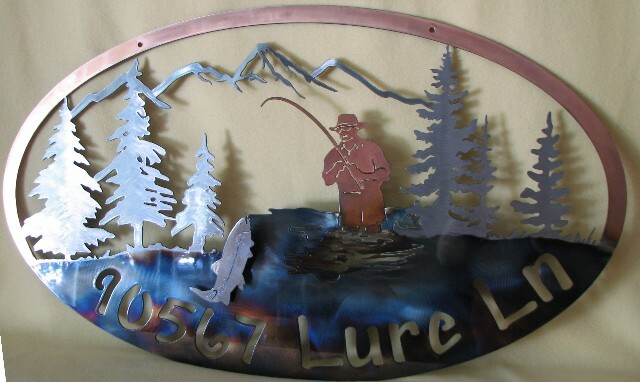 This was a "redo" of the originial sign making the name out of steel letters and rifinishing the rest of the sign. The letters and numbers are cut into the steel on this sign. 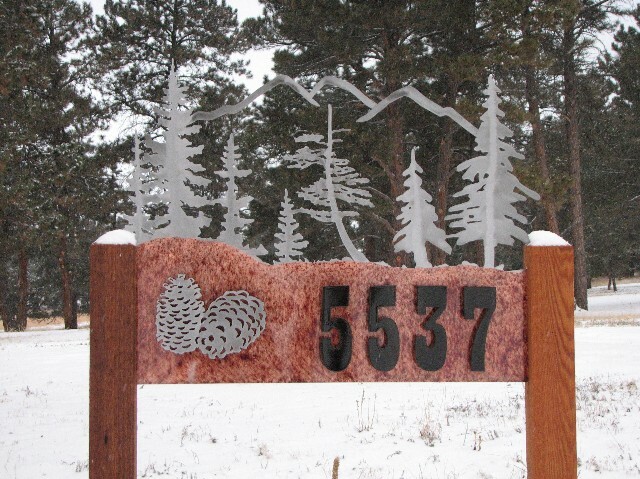 Sage green trees and raised pine cones with a backing plate to show the address information more clearly. 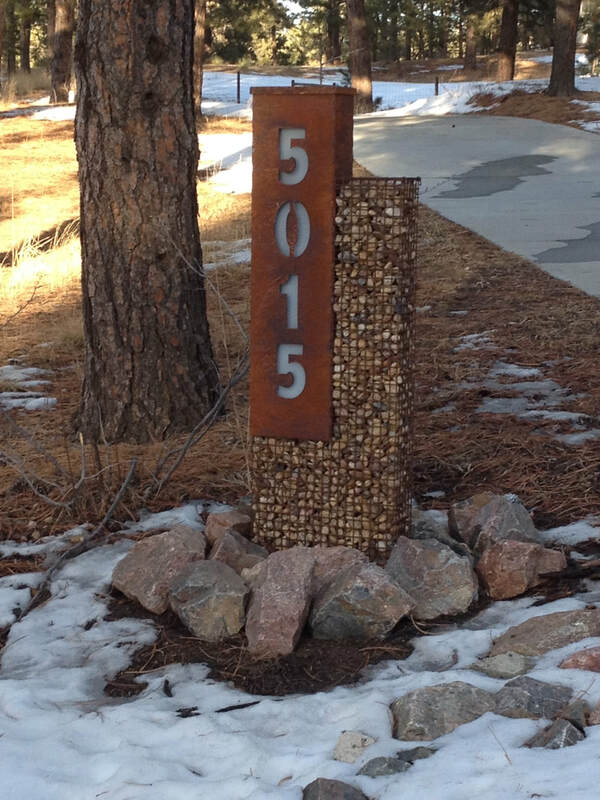 This sign is made with all trees and the pine cones and numbers are raised off of the sign.